American shoppers act in an irrational and wild manner every day of the year . 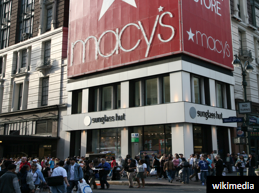 However, on Black Friday, shoppers' irrationality and wildness climb to dangerously high levels. Why does Black Friday lead shoppers to grab and fight, especially when they are often only grabbing for 50 percent off toasters? 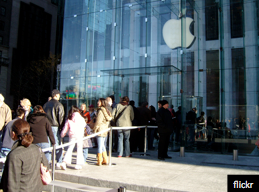 Over the last decades, social scientists have cataloged the many different factors that lead to shopper irrationality, and Black Friday touches on nearly that entire list, including some of the greatest irrationality hits (e.g. effort justification, removing self-control, poor math skills). 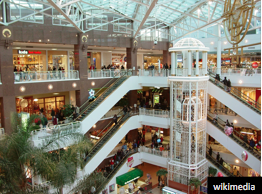 Luckily though, if shoppers stay aware of how Black Friday is designed to make them irrational and if they take breaks, eat snacks, plan ahead, and keep a clear mind, they can avoid falling victim to the "holiday." Here's the seven reasons shoppers become so irrational and committed to deals on Black Friday and a few ways you can protect yourself from the irrational sway of Black Friday. By 'lazy American' standards, people who come to Black Friday early are putting in an amazing amount of effort. They sacrifice sleep, football games, and significant others' approval to make the early bird sales. Psychologists find that when people go through pain and effort to reach a goal, then they end up having to "justify" the goal. For instance after a brutal college hazing ritual, new members do not turn their backs on the sadistic fraternity. Instead, the new members become even more intensely committed to the group. A shopper's first sleepless Black Friday acts as a hazing ritual that leads shoppers to intensely commit to the concept of Black Friday. Shoppers then glorify all of Black Friday's deals regardless of whether the deals are actually good, in the same way that many fraternity brothers glorify their fraternities regardless of whether the fraternities are actually worth glorification. People are vulnerable to irrational tendencies all the time, but when people are tired and overwhelmed they are at their most vulnerable. The scientific name for this state is "depleted." In a state of depletion people just don't have enough power or space in their brain to resist temptation or make complex decisions. Even math whizzes and businesses majors will falter when depleted. If we consider shopping a fight between the shopper and the business, then Black Friday shoppers arrive handicapped. They arrive without good sleep, with too many things on their minds, and stressed from the holidays. 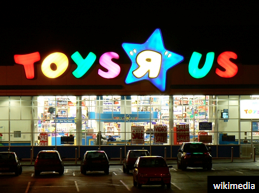 For companies, Black Friday is often like taking candy from a baby. Only here the baby resists even less. #3 What's another $10 after the first $500? It hurts to spend money. There's pain in parting with $10 for a flash stick. However, after spending $899 on a TV, the pain one feels parting with a Hamilton for a flash stick is practically gone. 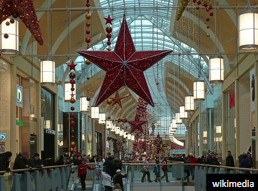 Restraint on Black Friday is even more unlikely because many Black Fridays tend to begin with the purchase of a large ticket item (e.g. a TV or computer). After the big purchase, every $10 flash stick, $11 dollar t-shirt, or $13 kitchen knife, will not lead to the "pain of paying" that keeps people from buying every random thing on aisle during the other 364 days of the year. Nobel Prize winners Daniel Kahneman and Amos Tversky explain that people are initially "loss averse": initially people really do not like losing money. However, once people start losing money, their aversion to losing money starts to go away. Accordingly, cautious spenders can quickly become big spenders. Ever thought your friends turn into entirely different people when they go shopping? Well, scientific research suggests that indeed shopping does change people. Yale consumer researcher Ravi Dhar and colleagues find that before one has purchased an item, a person is in a careful "deliberative" mind-set. They deliberate over the pros and cons of pursuing an action. Yet after the first purchase, a floodgate of "shopping momentum" opens up. People's minds cease to deliberate and change into a one-track focus on purchasing as they enter a state of what consumer psychologists call "shopping momentum". Fortunately, the phenomenon of "shopping momentum" can be interrupted by a break in shopping. However, on frantic Black Friday breaks rarely occur, so shopping momentum is likely to persist for hours, if not the entire day. In general shoppers show up to Black Friday with high hopes and very low math skills. This is a recipe for disaster. It takes a little bit of math to distinguish the good from the bad deals that Black Friday retailers make their true profits from. Research shows many adult Americans lack the basic math skills needed to evaluate whether a deal is good or bad. For instance, many Americans don't know that 10 percent of 1,000 is 100 or that 1/4 is larger than 3/20. Many Americans have what is known as "low numeracy" which means missing questions that national standards say elementary children should know. Are shoppers smarter than a 5th grader? Most often, the answer is no. 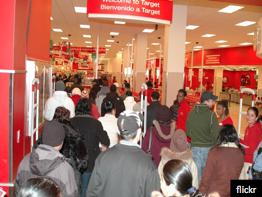 If shoppers don't have the math skills, they are likely to get swept up in Black Friday. Shoppers must make sure they have the skills or are with a friend who does or even have a smart phone application that allows for better product evaluation. 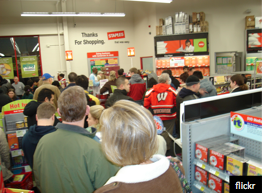 One problem for shopper rationality is that the amazing door buster deals on Black Friday may create a "Halo Effect" such that even the bad deals seem amazing by association. Black Friday shoppers must think of Black Friday as a day that has some good and some bad deals instead of just a uniformly good deal day. Businesses want Black Friday to be crowded. Not just because they want lots of wallets but because crowds change people. In the case of Black Friday, crowds can remove all sense of guilt. Few shoppers feel guilty buying another half-off toaster when the customers next to them have flat screens in their carts. When everybody's peers are doing it and some peers are "doing it worse," the painful experience of parting with money becomes a joyous spending spree. Indeed research on "social influence" finds that the examples of others can drive people to irrational and even unethical behavior. Don't get too tired. Use a calculator. Decide what you want ahead of time. And don't get brainwashed. Yes Black Friday is fun. Yes Black Friday is a day of great deals. But Black Friday is also a trap that's very easy to fall into. Happy and responsible shopping everyone! Troy Campbell is a researcher at Duke University's Fuqua School of Business and Center for Advanced Hindsight. He also has not missed shopping on Black Friday since 2007.
Who doesn't know that impulse purchases are a bad idea? I've even realized it was a bad idea as I was doing it. So here are three quick tips: <strong>1. Make a shopping list.</strong> Take it with you and stick to it. <strong>2. Eat beforehand.</strong> An empty stomach can doom the most prepared shopper, especially at the supermarket. <strong>3. Shop alone.</strong> Bringing children (or a significant other who acts like a child) is a sure way to fill your cart with impulse buys.